Rist’s imagery has several foundations, and invites just as many interpretations. Culled from resources as rich and varied as fairy tales, feminism, contemporary culture, and her own imagination, the artist’s color-saturated, kaleidoscopic projections are a sophisticated visual amalgam of wit, humor, and irony. Ever Is Over All is a video installation comprising two sharply contrasting projections on adjacent walls accompanied by a melancholic melody. 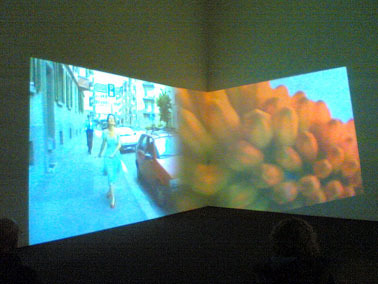 On the right is a large field of bright-red long-stemmed flowers, filmed in close-up with a roving camera. On the left, filmed in medium- and long-shot, is a smiling young woman in a blue dress and red shoes. 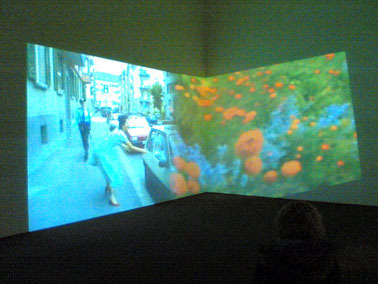 Walking toward the viewer in slow motion along a car-lined sidewalk, she suddenly raises what appears to be one of the blooms seen in the projection to the right, and, in a burst of inexplicable violence, uses it to smash the window of a parked vehicle. As she moves down the sidewalk and shatters another car window, a policewoman approaches from behind and offers a friendly salute in passing. The anarchic young woman gleefully carries on breaking windows. Fiction-versus-reality is an important theme for Rist, in whose work an odd combination of nightmare and magic prevails over the logic of common sense. In Ever Is Over All, the artist juxtaposes the field and its flowers with her magically powerful wand, and transposes acts of aggression and annihilation into benevolent and creative ones.